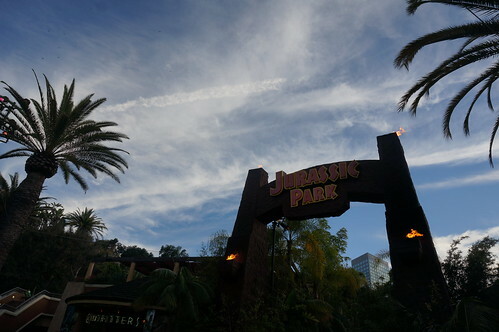 Dusk over Jurassic Park at Universal Studios Hollywood. 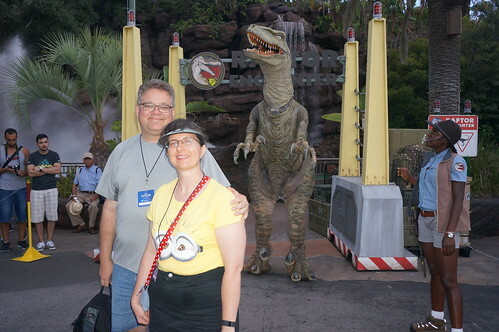 Tracey and Scott at the Raptor Encounter outside of the Jurassic Park ride at Universal Studios Hollywood. 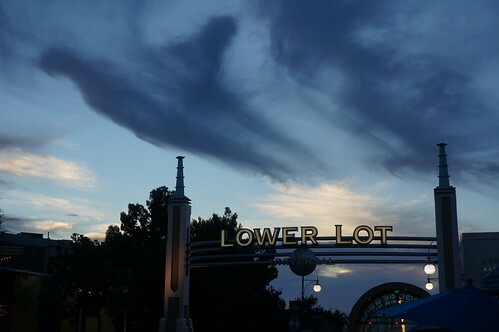 Dusk over the entrance to the Lower Lot at Universal Studios Hollywood. 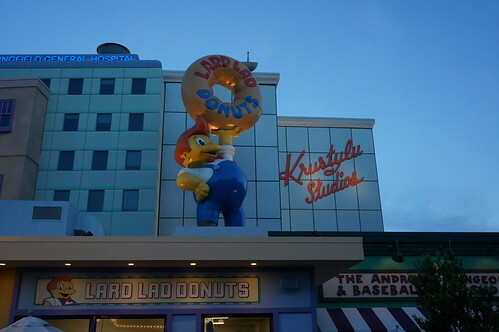 Lard Lad Donuts, Krustylu Studios and the Android Dungeon at Springfield U.S.A. in Universal Studios Hollywood. 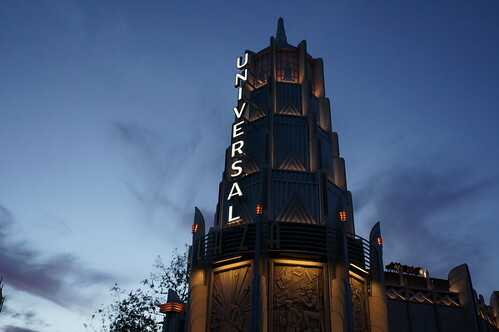 Entrance to Universal Plaza at Universal Studios Hollywood. 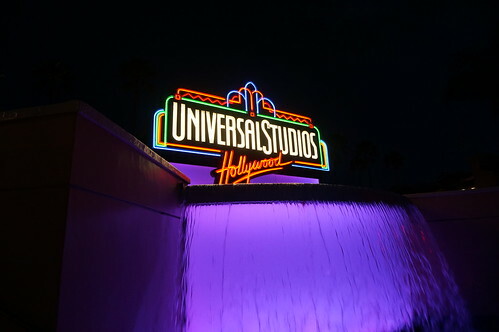 The sign at the entrance of the "The Entertainment Capital of LA", Universal Studios Hollywood. 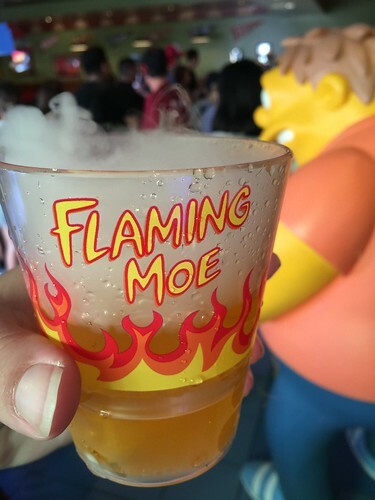 A Flaming Moe drink from Moe's Tavern in Springfield, U.S.A. at Universal Studios Hollywood. The drink kinda tastes like Tang. 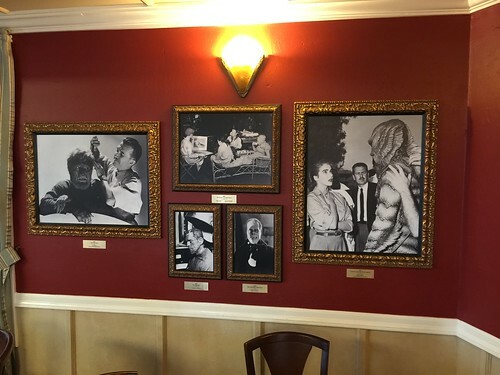 Pictures hanging in the restaurant where the VIP tour stops. 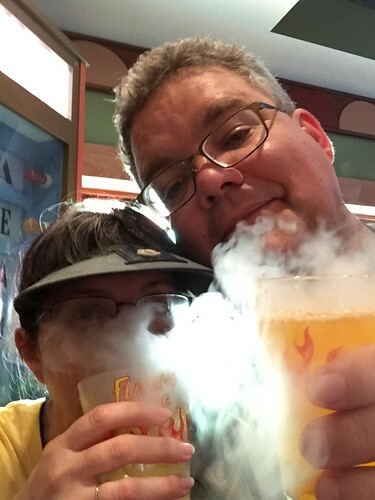 Happiness is just a Flaming Moe Away! 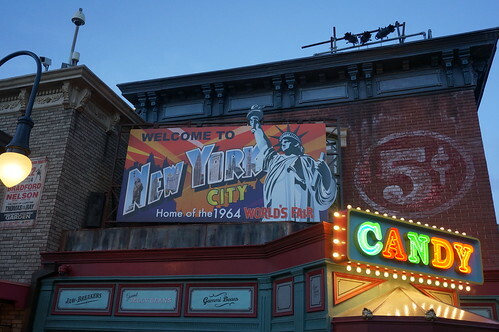 Moe's Tavern in Springfield U.S.A. at Universal Studios Hollywood. Steamboat Willie pilots the Mark Twain riverboat near the end of Fantasmic! at Disneyland. 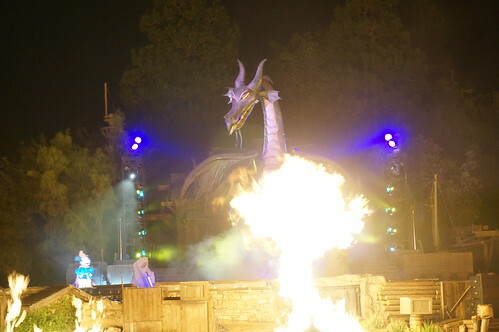 Mickey and Maleficent's final form in Sleeping Beauty square off in Fantasmic! at Disneyland. 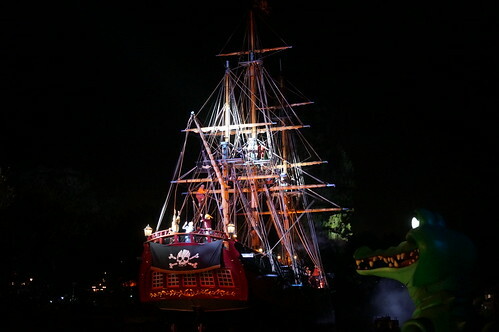 Tick-Tock follows the Sailing Ship Columbia looking for Captain Hook during Fantasmic! at Disneyland. 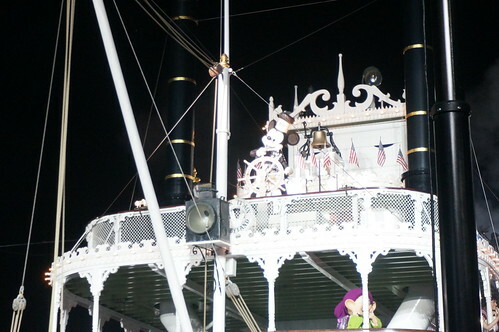 Saling Ship Columbia in Fantasmic! 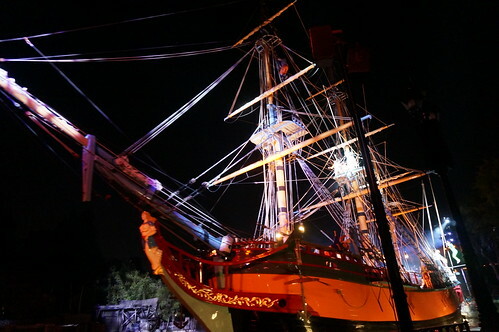 The Sailing Ship Columbia stands in for Captain Hook's pirate ship during Fantasmic! at Disneyland. 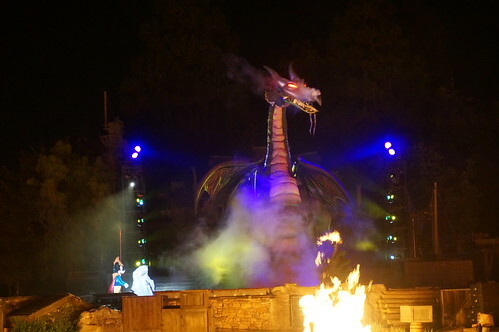 Mickey Mouse near the start of Fantasmic! at Disneyland. 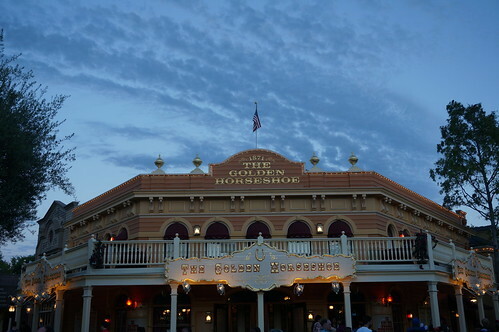 The Golden Horseshoe in Frontierland within Disneyland. Picture was taken at dusk. 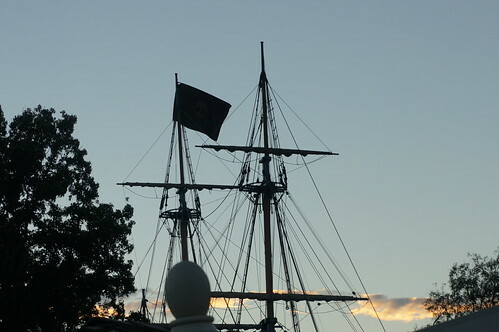 The Sailing Ship Columbia flying the pirate flag at dusk. 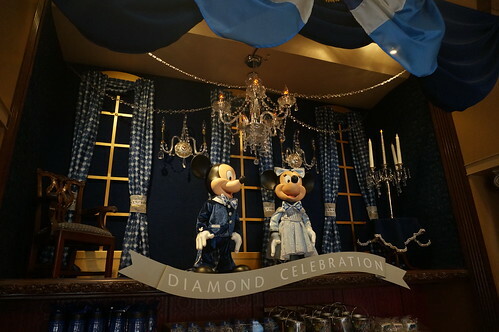 The ship was being prepared for the Fantasmic! 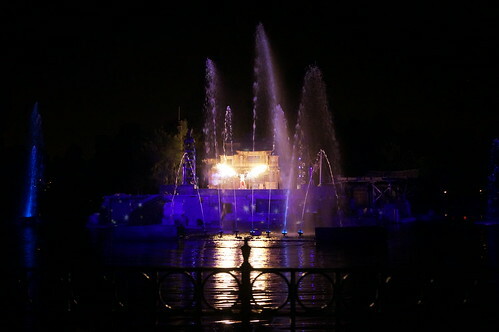 performances later that evening. Opera House - Main Street USA: This ordinary wooden bench, has an extraordinary history. 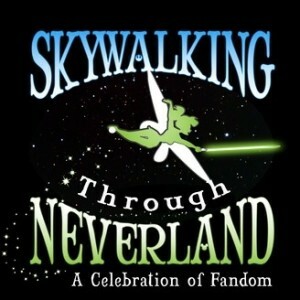 According to Walt Disney, the idea for a Disney-themed amusement park came to him while sitting on a park bench. He thought about creating a new kind of amusement park, while he watched his daughters ride the Griffith Park Merry-Go-Round. 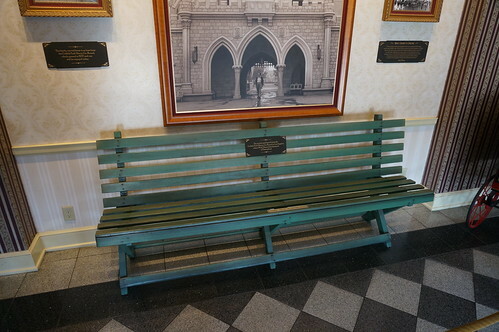 The park bench that Walt Disney sat on, while he imagined what would become Disneyland, is currently on display in the Opera House lobby.